Deciding how much to spend on flowers for a funeral can be difficult but with a little understanding and planning, funeral flowers can be cheaper than you might expect. , as well as in the church (although these may already be present thanks to the church volunteers) – even on top of the funeral cars. 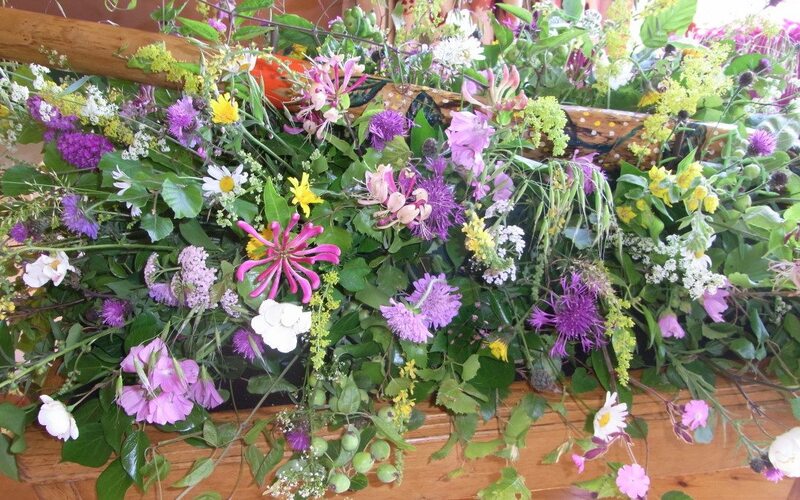 There are also excellent independent flower arrangers you may know of. Typically they will charge between £50 and £100 for a funeral flower arrangement. But be careful to make sure there are plans in place for collecting or having the flowers delivered on time. You can pick flowers and greenery from your own – or your loved one’s – garden, and create your own ‘floral tribute’ (as these things are – rather stuffily – called in the trade). This process can be wonderfully calming and reflective, and make the flowers an important and very personal part of the farewell. As well as ten years as a funeral director, James has been a keen gardener, landscaper and artful outdoor carpenter in the Stroud area; he is married to a botanist and garden designer. A desire to work with families who want to bring beauty and a personal approach into the funeral arrangements is central to Family Tree’s special interest.